Senior Minister of State for Defence Heng Chee How officiated at the launching ceremony of the Republic of Singapore Navy (RSN)'s eighth and final Littoral Mission Vessel (LMV), Fearless, at ST Engineering's Benoi Shipyard today. The LMV was launched by Mrs Heng Soon Poh, wife of Mr Heng. On the launch of Fearless, Mr Heng encouraged the crew to "live up to the fearless spirit of our founding fathers and continue to live out its legacy. As you embark on your next journey to defend our sovereignty, our security, and our economic prosperity, I am confident that you will overcome all challenges fearlessly, never flagging in adversity." The launch of Fearless is a significant milestone in the RSN's continued transformation to enable it to continue safeguarding the sovereignty and security of Singapore's waters. The LMV programme is progressing well. Since 2017, five LMVs – RSS Independence, RSS Sovereignty, RSS Unity, RSS Justice and RSS Indomitable – have been commissioned. They have rapidly assumed and effectively executed operational duties, including the DPRK-US Singapore Summit and daily maritime security patrols, and have participated in exercises such as the ASEAN Multilateral Naval Exercise and Singapore-India Maritime Bilateral Exercise. LMVs Fortitude and Dauntless, launched in 2018, are undergoing sea trials and will be commissioned later this year. All eight LMVs will be fully operational by 2020. 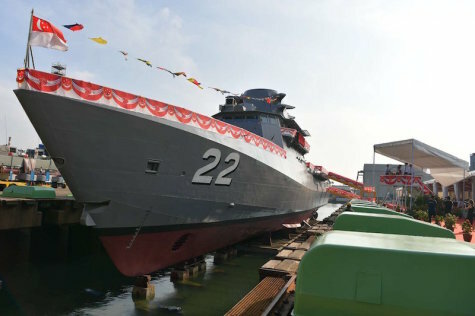 SINGAPORE --- The Marine arm of ST Engineering has successfully launched the final of eight Littoral Mission Vessels (LMVs), Fearless, that the Group has designed and built for the Republic of Singapore Navy (RSN). The launching ceremony was officiated by Mr Heng Chee How, Senior Minister of State for Defence, at its Benoi shipyard, where all eight vessels were built. In accordance with naval tradition, the spouse of Mr Heng, Mrs Heng Soon Poh, was the lady sponsor to name and launch the final LMV. Senior officials from the Ministry of Defence (MINDEF) and the Singapore Armed Forces were in attendance to witness the ceremony. “Today marks a major milestone in the shipbuilding history of ST Engineering. Six years ago, together with MINDEF, RSN, and Defence Science and Technology Agency, we embarked on this journey to design and build these eight state-of-the-art Independence-Class Littoral Mission Vessels (LMVs). This is the last of the eight to be launched and named. For this project to come to this stage is yet another testament to our deep engineering capabilities in large-scale engineering projects,” said Ng Sing Chan, President, Marine, ST Engineering. To date, ST Engineering has delivered RSS Independence, RSS Sovereignty, RSS Unity, RSS Justice, RSS Indomitable and LMV Fortitude. ST Engineering was awarded the contract by MINDEF in 2013 to design and build eight LMVs for the RSN. The fleet of eight LMVs will replace the Fearless-Class Patrol Vessels, also designed and built by the Group in the 1990s. ST Engineering is a global technology, defence and engineering group specialising in the aerospace, electronics, land systems and marine sectors. The Group employs about 22,000 people across offices in Asia, the Americas, Europe and the Middle East. Headquartered in Singapore, ST Engineering reported revenue of S$6.62b in FY2017 and it ranks among the largest companies listed on the Singapore Exchange. The Marine sector provides turnkey and sustainable solutions to a worldwide clientele in the marine, offshore and environmental engineering industries. In shipbuilding, it has proven capabilities from conception to detailed design, construction, on-board system installation and integration, commissioning to through-life support. As a maritime nation, the sea is Singapore's lifeblood and connects us to the world. The Republic of Singapore Navy (RSN)'s Maritime Security Task Force (MSTF) is the first line of defence to safeguard Singapore's maritime security 24/7. The RSN's 182 Squadron, comprising Littoral Mission Vessels (LMVs) and Patrol Vessels (PVs), is at the forefront of this effort. Alongside other maritime security agencies, they conduct daily operational patrols and respond to maritime threats to Singapore. The first-of-class, RSS Independence, was commissioned on 5 May 2017 by Prime Minister Lee Hsien Loong as part of the RSN’s Golden Jubilee. Since then, RSS Sovereignty, RSS Unity, RSS Justice, and RSS Indomitable have also entered operational service. The RSN launched its eighth and final LMV, Fearless, on 26 January 2019, marking a milestone in the LMV programme. The LMV project started nine years ago in 2010, and is jointly developed by the RSN and the Defence Science Technology Agency (DSTA). The Independence-class LMVs are constructed by Singapore Technologies Engineering Ltd's subsidiary, ST Marine. Designed and built locally, the LMVs pushed the boundaries of engineering and design to deliver a more capable, faster, and mission-flexible ship with better seakeeping and endurance. The LMVs are equipped with smarter technology and sharper capabilities to enable the RSN to operate more efficiently and effectively, while being manned by a leaner crew. This is made possible through the harnessing of technology, streamlining of work processes, and rethinking operating concepts. An example is the co-location of the Bridge, Combat Information Centre and Machinery Control Room at the Integrated Command Centre (ICC). The ICC integrates and synergises the management of navigation, engineering, and combat functions to achieve greater operational effectiveness for maritime security operations. Beyond the physical hardware, the effectiveness of a ship lies in the proficiency of its people. The LMV is manned by a crew of 23, all of whom undertake multiple roles on board the ship. To build proficient crews, training is tiered at the individual, team and ship level, supported by simulators and emulators. This approach delivers the highest outcomes for personal proficiency and team excellence, so as to be ready for the full spectrum of mission sets at sea. High-fidelity training is conducted at RSS Daring – the LMV Simulation Centre (SIMCEN). The simulator employs technology, such as virtual reality goggles, to replicate the experience at sea and enable realistic training by putting the crew through a wide range of scenarios. Training is also more effective, using analytics to monitor individuals and allowing for prompt correction to enhance learning retention and speed. The LMVs have further strengthened the seaward defence of Singapore and the RSN's ability to protect our sea lines of communication and our way of life. All eight LMVs are expected to be fully operational by 2020.